The workforce is changing. Millennials are on the move, and it's up to employers to stay ahead of the curve. Tech companies like Google are constantly creating new ways to connect with their users. It goes much further than large companies selling users a new product. Mobile innovations allow workers to learn faster to be ready for an evolving job market. Nowhere is this more true than industries where workers are on their feet. There's no time to stop in restaurants, coffee shops, and hotels. This is where mobile training becomes most useful. Tablets, phones, and other devices go wherever you are. Some restaurants use them to accurately and efficiently take orders or track open tables giving servers access to the full menu in their hands. The same tools can streamline the training process for better workers who are prepared to grow. What does this mean for employers? Expect greater efficiency. When workers have the tools they need to learn, they can focus on all the ways they can do the job better. This could mean increasing their speed or coming up with new ways to make your business better. Create the leaders of tomorrow by instilling confidence and practical skills. Modern mobile technologies provide a less labor intensive way to teach workers what they need to be successful and the training they want to become the leaders of tomorrow. Retain valuable employees. 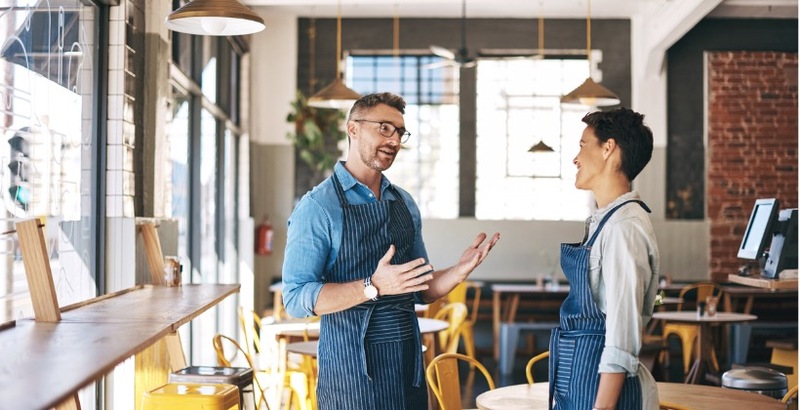 One of the biggest challenges for many restaurants, hotels, and similar businesses is turnover. Employees quit unexpectedly, don't show up to work, etc. Studies suggest the millennial workforce isn't flaky. They leave when they find a lack of opportunities. Mobile Learning tools can help companies retain valuable workers. Keep it short and sweet. You have an efficient and tech savvy workforce. Take advantage of that fact. Find mobile learning tools designed for efficiency. Microlearning has become popular because it breaks things down into smaller, easy to digest pieces. Learners understand more and perform faster. It also caters to the naturally short human attention span. Right when your mind is getting bored of a topic, you're onto something new. Find something accessible. Millennials are tech savvy, but if learning is too complicated, it creates frustration. Even tech savvy millennials have their limits when it comes to learning options. Choose accessible programs that keep the learning process natural. Microlearning is a big part of this. It shouldn't take too long to use the training tools. Choose the right equipment. It might be tempting to save a few bucks with outdated equipment. You don't need brand new gear. Any mobile devices you choose should be in good shape and advanced enough to keep up with modern learning programs. Slow load times, freezing screens, and other common technical issues get in the way of learning and frustrate everybody involved. The right equipment is critical to successful training with millennials. Collaborate and create a team. Communal learning is crucial in many active workplaces. Employees are constantly working together and collaborating to get the job done. Everyone has to do their part. Each team member learns their individual part. It only works when you put it all together. Any mobile training tool should work towards a collaborative end if it doesn't incorporate team work through the entire training process. Training a successful millennial workforce requires forward thinking and a drive for progress. With Mobile Learning, you'll find greater success with a driven workforce. Download this guide for more information on modern training methods and how to maintain brand consistency while growing.